Topoisomerase II alpha antibody recognizes DNA topoisomerase 2-alpha, also known as DNA gyrase, or DNA topoisomerase (ATP-hydrolyzing). Mouse anti Human topoisomerase II alpha antibody recognizes DNA topoisomerase II alpha, also known as DNA gyrase,TOP2A and DNA topoisomerase ATP-hydrolyzing. TOP2A encodes a DNA topoisomerase, an enzyme that controls and alters the topologic states of DNA during transcription. This nuclear enzyme is involved in processes such as chromosome condensation, chromatid separation, and the relief of torsional stress that occurs during DNA transcription and replication. It catalyzes the transient breaking and rejoining of two strands of duplex DNA which allows the strands to pass through one another, thus altering the topology of DNA. Two forms of this enzyme exist as likely products of a gene duplication event. The gene encoding this form, alpha, is localized to chromosome 17 and the beta gene is localized to chromosome 3. The gene encoding this enzyme functions as the target for several anticancer agents and a variety of mutations in TOP2A have been associated with the development of drug resistance. Reduced activity of this enzyme may also play a role in ataxia-telangiectasia (provided by RefSeq, Jul 2010). 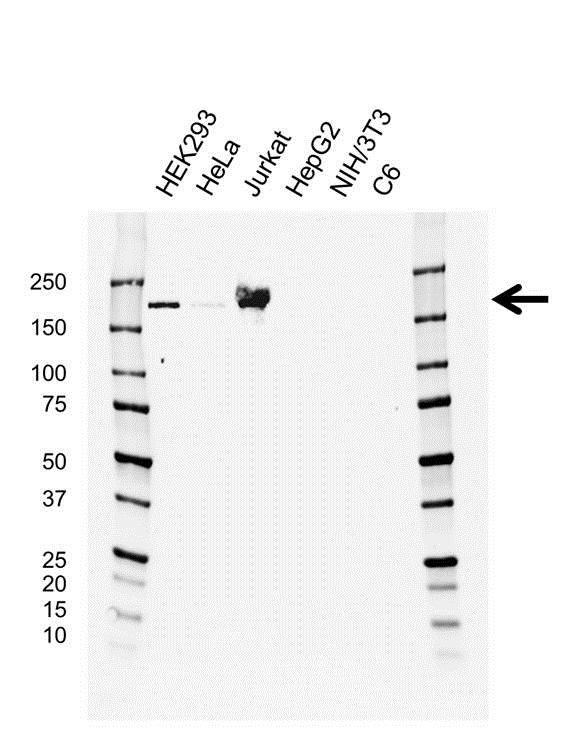 Mouse anti Human topoisomerase II alpha antibody detects a band of 191 kDa. The antibody has been extensively validated for western blotting using whole cell lysates.